Looking to bring a smile to your man this holiday season? Check out the all new Sol Republic Tracks Air Wireless Headphones. 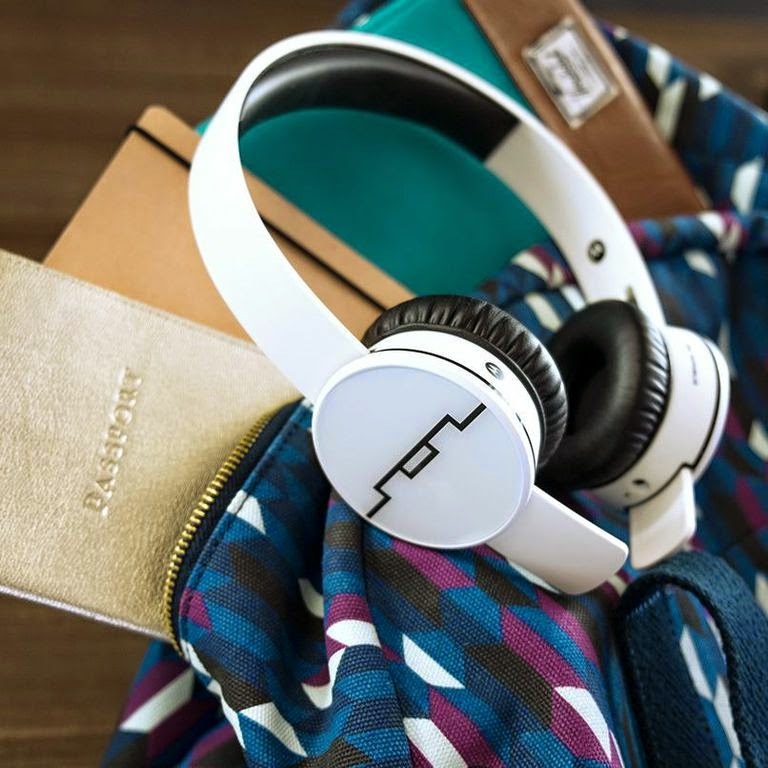 The Sol Republic headphones come with a 100 day money back guarantee. Lasting for 15 hours of play time! Connect to two devices simultaneously, including your phone, tablet or computer. Seamlessly answer an incoming call while watching a movie on your tablet. You can purchase them in Black, White, Red or Blue. You can purchase them at Radio Shack, Amazon and of course Sol Republic's website solrepublic.com. Enter to win one! Contest will end January 19th 2015. Open to U.S. residents only. ZEMs are the shoes which you don't seem like a shoe at all! ZEMs are great for travel when space is a concern: check-in luggage at a premium, while hiking or on the road by bike or bicycle. ZEMs are very collapsible and easy to fit into a backpack or saddle bag, and provide that 2nd pair of shoes that allow you to go to the gym, the beach or do a yoga class. 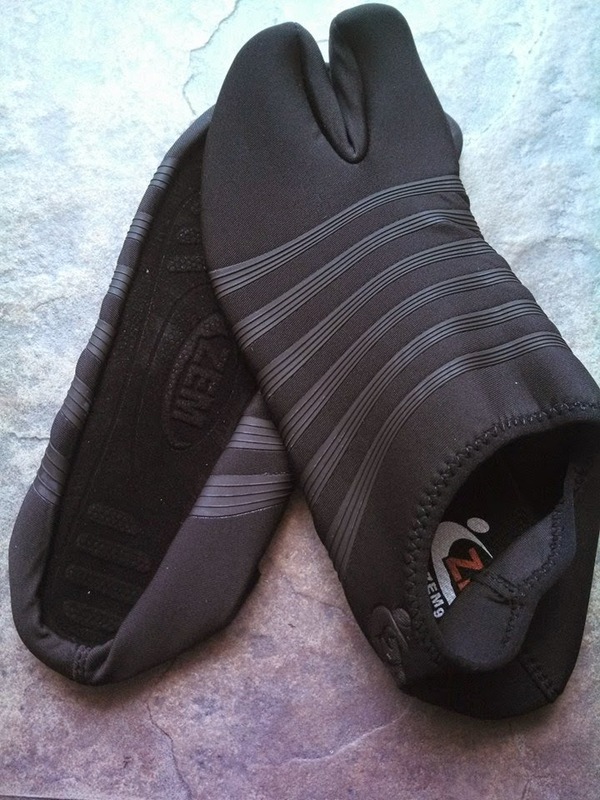 ZEMs have so many uses, I know for me I hate having shoes on, so I often drive without shoes especially taking kids to school, with Zems I don't feel as though I have a shoe on I feel like I have socks they are really great. You can get more info on Zems by visiting their website here. Having a hard time figuring out what to get your man? Check out The Mantry which is the Modern Man's Pantry which is a food of the month club. Each month your man will receive a create full of goodies, So its a gift which keeps on giving. Each Mantry includes 6 full size artisan food products delivered to their door. Packed in a Handmade Wooden Crate and custom Manual detailing product stories and recipes. 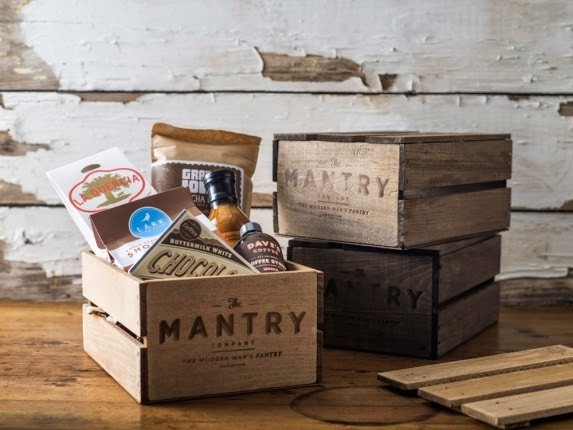 BONUS Jerky Kit: Get a free Mantry Jerky kit ($30 Value) with a 3 or 6 month gift subscription. Ships with their 2nd crate. Hurry deal Ends on Dec 25th. What will you get? I know my husband is the family cook and he enjoyed his Mantry box which he discovered some new tasty foods that he later shared with us. You can purchase your gift box by clicking here. The Shave Well shower mirror offers an affordable alternative and is uniquely designed to be truly fog free and makes shaving simple, easy and more comfortable. Before shaving simply run the mirror under the shower for a couple seconds to warm it up and then re-hang on the hook. Wa-la, a truly fog-free shave option. . . . and, he can even start admiring his new sleek look before reaching for his towel. 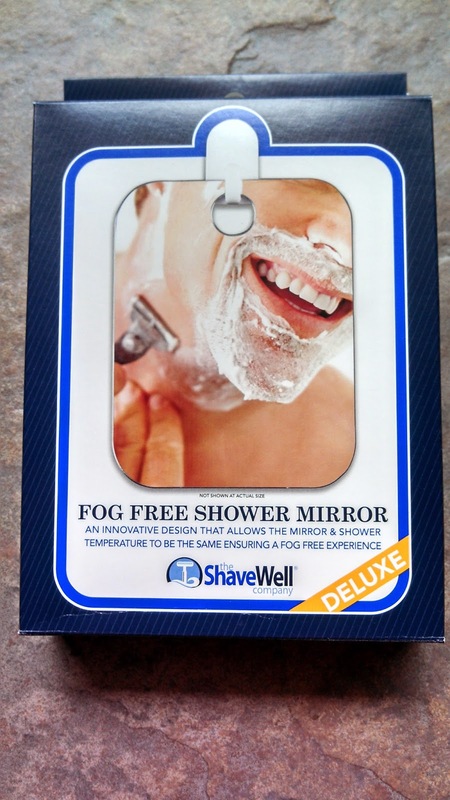 Enter to win a Shave Well deluxe mirror, open to U.S. residents only, contest ends December 10th, 2014. Every beard product was developed and created with Jep’s vision and input by Honest Amish’s knowledge and knowhow. Hand crafted from the best organic oils, butters, and essential oils in the world then blended by true bearded masters. No fragrances or man-made chemicals are in any one of our products, pure, natural, and good for the beard. 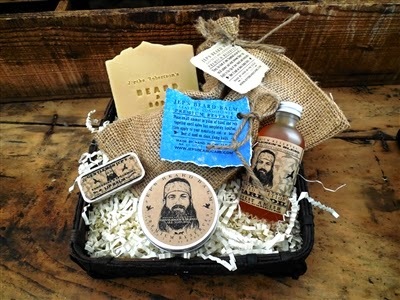 Jeptha Robertson's Hand selected Beard Care Gift Basket. Includes 1- Jep's 2oz Beard Balm 1- Jep's Premium Beard Wax 2oz 1- Jep's Lip Balm (Grapefruit & Peppermint) 1- Jep's Gentleman's Blend Beard Soap 1- Jep's Premium Beard Oil 2oz. You can purchase these great products by clicking here. Beard Beanies are a fun way to keep your face warm. 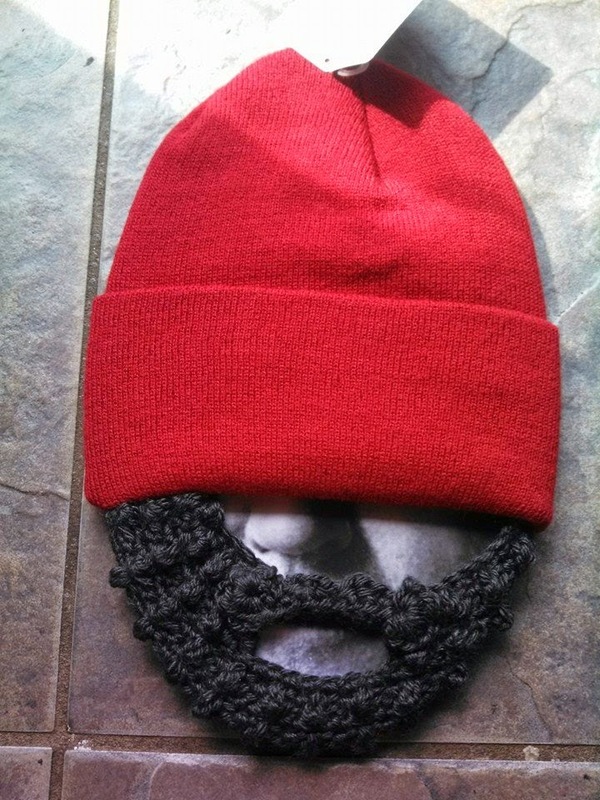 The Beard Beanie is exactly that, its a beanie attached to a crochet beard. With the help of Thinsulate the Beard Beanie traps body heat, but allows for moister to escape, keeping you nice and warm during the colder months. Beard Beanies are fun ways to express yourself and really stand out while staying warm. You can purchase Beard Beanie's by visiting their website here. Also are sold in kids sizes! 5 Winners will be picked to choose their very own Beard Beanie (Excludes the Rasta) Contest will run from November 12th to December 17th 2014! Open to U.S. residents only. Lets face it drinks at games cost way to much you can purchase two 6 packs for the price of one beer! Now with the You Can Hide It, no one will ever suspect this ordinary looking ice pack is really the secret to your Friday night fun! 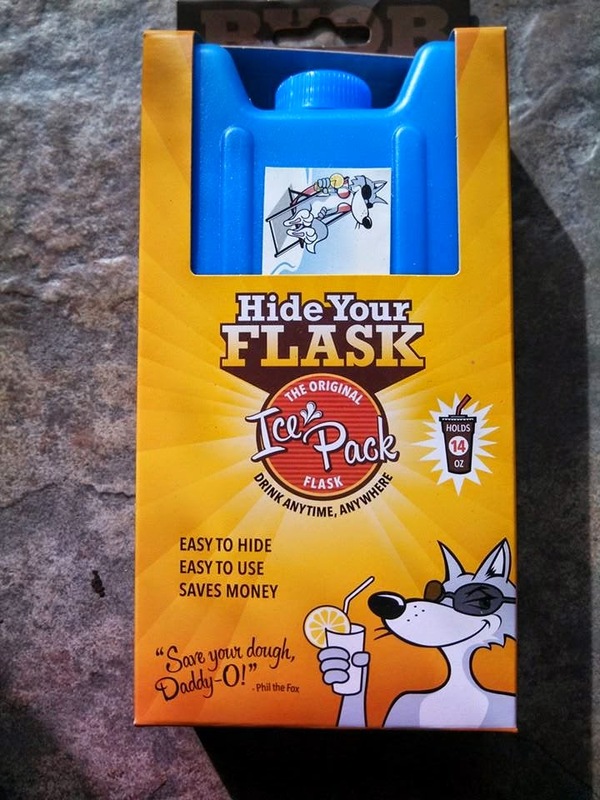 Hiding 14 ounces of your favorite beverage right in plain sight, your ICE PACK FLASK will look just like a regular ice pack. Toss one (or many) into an ice chest, cooler, insulated lunch bag or backpack. If you like a nice cold one, fill & freeze first …and just chillax baby. Just fill, freeze & enjoy a nice cold one! You can purchase the You Can Hide It Icepack and more by visiting their website here. Also on Amazon. The Martian Notifersmartwatch brings a convenience of notifications to a fashion-forward timepiece at a down-to-earth price. The Martian Notifier is an attractive, colorful analog wristwatch with an intergrated OLED readout that acts as a hands-free gateway to the world, keeping you well informed while your phone remains in a pocket or backpack. What makes the Martian Notifier unique is that your able to receive real-time alerts and notifications on your wrist. The Martian Notifier App, will automatically receive notifications -including Caller ID, texts, Facebook, Twitter, Weather, Email, and so much more. You can also initiate voice commands on your smartphone's speakerphone for uses such as "read text" while your out and about. 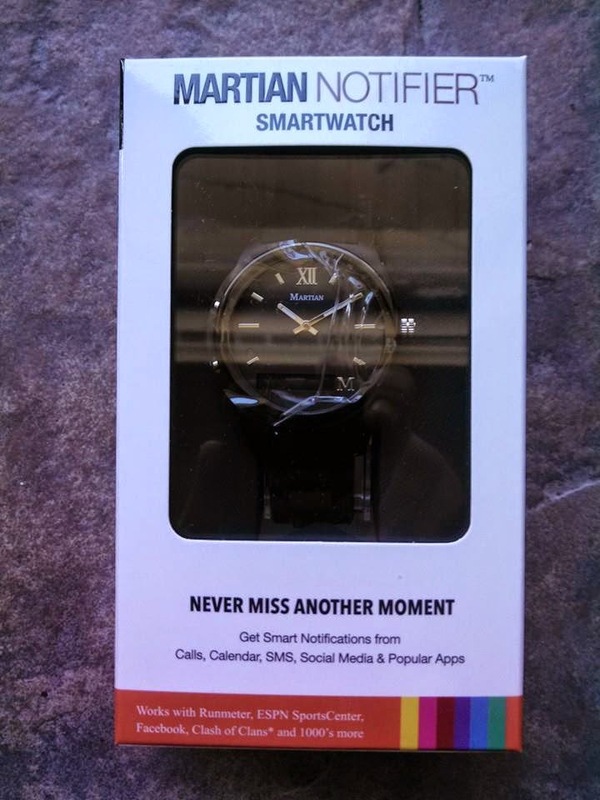 • Silent alarms, hour repeater, virtual phone leash, find phone, camera shutter control, and more! You can purchase the Martin Notifier by visiting their website here. While there check out all the other great products, there is something for everyone on your holiday list. 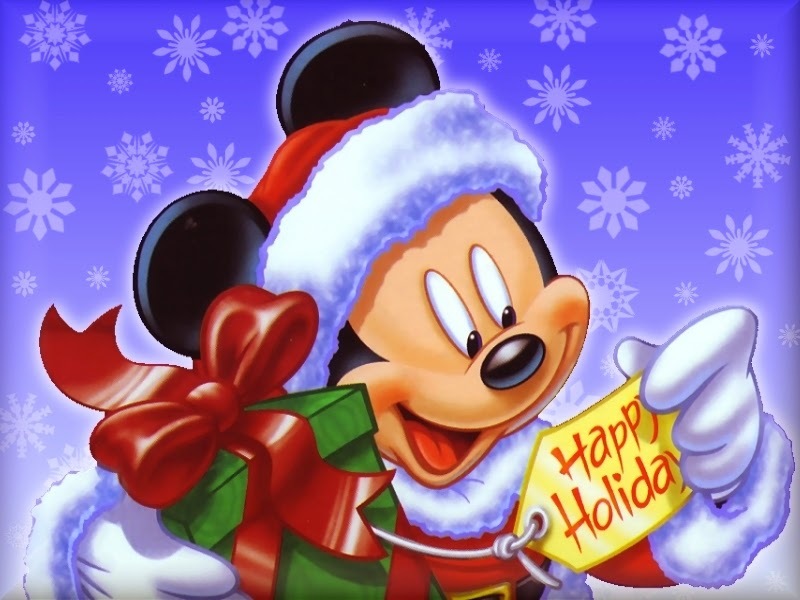 The best gift is the gift that helps many, the St. Jude foundation has all kinds of products in which make a great gift along with 100% of the proceeds go to the St. Jude Children's Research Hospital. You can find things like these cute Santa and Reindeer Hot Chocolate stocking stuffers for only a $5 donation to the St. Jude Children's Research Hospital. Visit the website by clicking here. This year why not try something different for the man in your life and put together a Sports themed basket. When making up your basket, why not include some Southern Recipe Pork Rinds. I am a huge fan of the Hot & Spicy, but did you know they have more flavors like Salt & Vinegar, Sweet BBQ, Original, and Bar-B-Q. 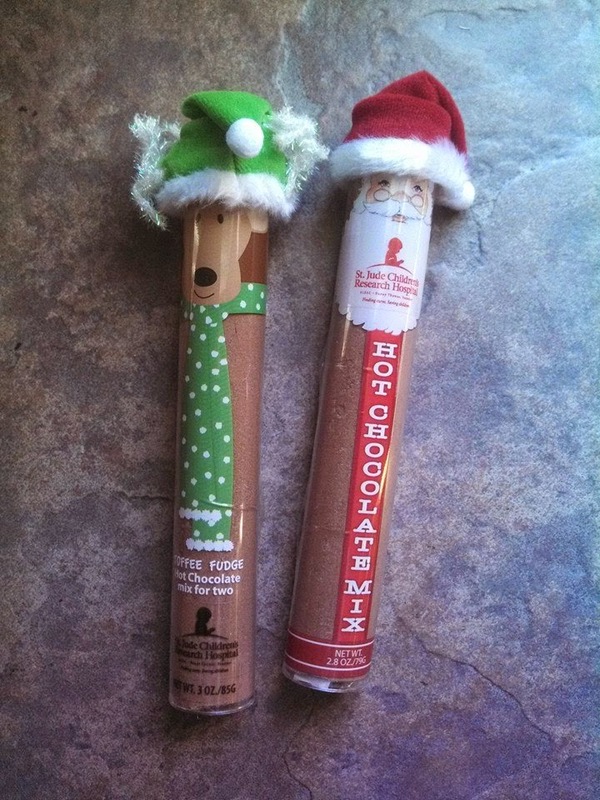 Makes for a great stocking stuffer or added holiday treat. Can be bought at most gas stations and grocery stores, along with major retail stores. 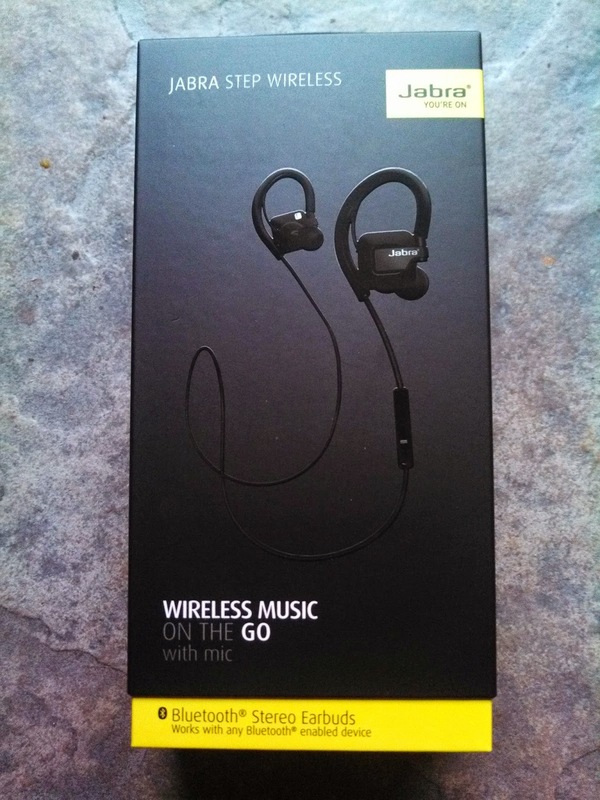 Jabra Step Wireless Earbuds is a great headset which allows you to give up the cords, while listening to music, playing games and answering calls. The Jabra Step Wireless Headset has quality stereo sound meaning he is gonna hear everything in his headset loud and clear. No more reaching for your phone to answer a call or change a song you can do this now all with your earbuds. The Step Wireless Earbuds are made for the active person they are soft with GelHooks and come with a choice of three EarGels to ensure they fit naturally and securely. What really sets these earbuds off is that they are both dust and water resistant. You can pick up a set for your man by clicking here. 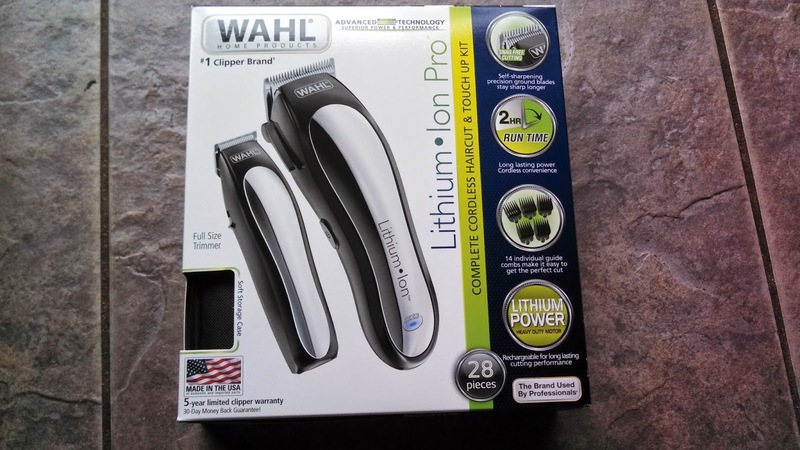 Lithium Ion Clipper – Wahl’s most powerful battery operated clipper, clocking in at one hour and forty minutes on a full charge. The long lasting run-time and soft travel case allow for haircuts here, there and anywhere. The kit also includes a full size detailer. MSRP $69.99 You can purchase Wahl's Lithium Ion Clipper at your local retail store or on Amazon. 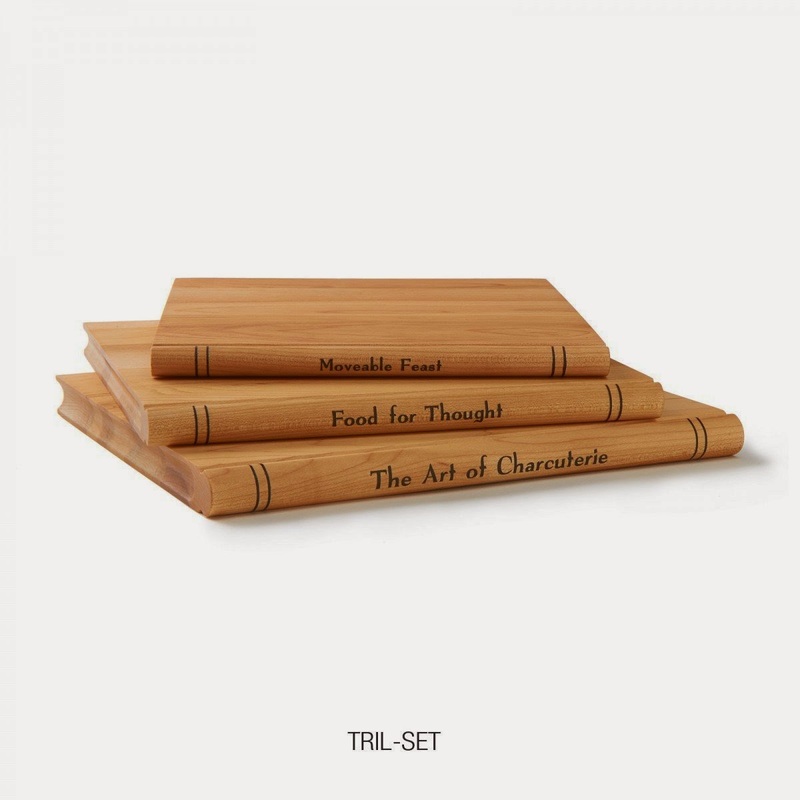 This year think outside the box with the Trilogy Serving Boards. This is a nice set of chopping boards which would look great in any kitchen. They make for a really unique elegant gift for anyone. Each board has a title on the side and is shaped like a book the biggest is about 8 x 6 then a 7 x 6 and finally a 6 x 6. You can purchase this set on Amazon. A darker, bolder spiced rum, crafted with black strap rum for a deliciously smooth finish. Try it on the rocks or in one of Captain Morgans classic cocktails. 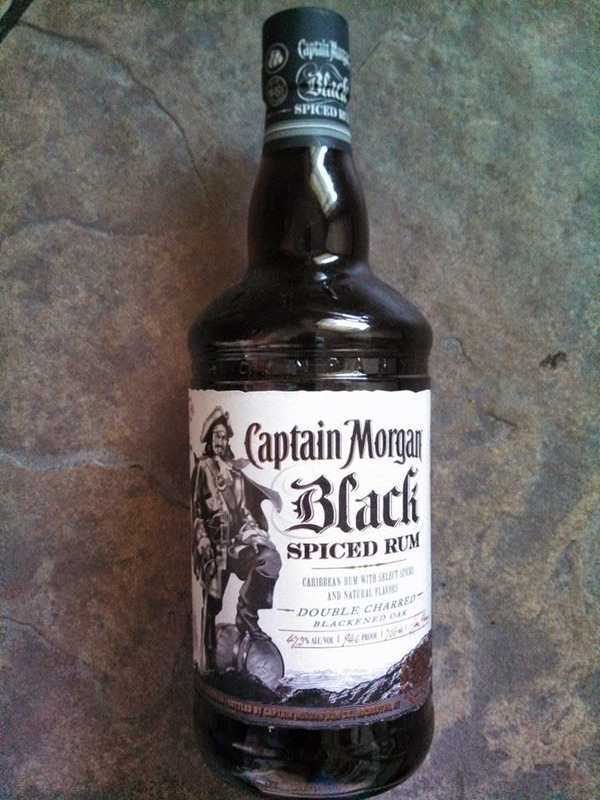 Can be purchased Captain Morgan Black Spiced Rum at your local liquor store. Please remember to drink responsibly. Contains 47.3 % alcohol. Experience the benefits of TrueWireless Stereo™, which lets you create your own stereo system wirelessly using two SyrenPro™ speakers. This outdoor weather-resistant Bluetooth® speaker combines superior jAura® acoustics and unique design elements for a completely stunning sound. It’s perfect for your outdoor party. Need big sound from a portable speaker? Look no further than SyrenPro™. Equipped with jAura® sound enhancement technology, SyrenPro™ provides a perfect balance of high, middle and low range frequencies. It has a 3” co-axial speaker that delivers powerful, high fidelity sound capable of filling rooms and outdoor areas. With two power options, you can play music from SyrenPro™ however you want. Plug SyrenPro™ into an electrical outlet or go wireless and take your music with you anywhere you go. A rechargeable battery provides up to four hours of playtime, so you can enjoy your music even if the speaker isn’t plugged in. SyrenPro™ is a great-sounding speaker, but you can get even bigger sound when you connect it to a second SyrenPro™. The TrueWireless Stereo™ feature allows you to wirelessly pair two SyrenPro™ units to create a full stereo system. Now when you stream music from your phone, both speakers will play, providing an immensely rich and clear soundscape. Take SyrenPro™ to your next outdoor event. Its UV- and splash-resistant coating protects it from exposure to the elements. 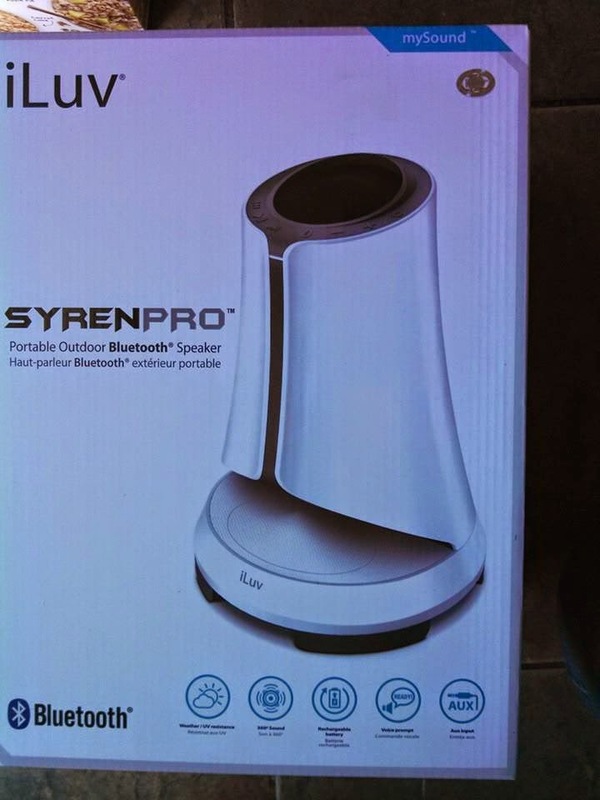 Whether you’re having a pool party or hanging out at the beach, SyrenPro™ is the perfect speaker to bring with you. You can purchase by visiting iLuv website here or on Amazon. Polaroid POLC3 Cube HD Digital Video Action Camera Camcorder (Black) is the:World's Funnest, Cutest Lifestyle Action Camera in Tiny Cubic Package6MP CMOS. Sensor for Crisp Images; Selectable 720p or 1080p Video Rate124-Degree Wide-Angle Lens Effortlessly Captures Big, Vibrant Scenes. Built-In Rechargeable Battery Records 90 Continuous Minutes Per Charge. Mounts Magnetically or w/Clip for a World of Exciting Action Applications. 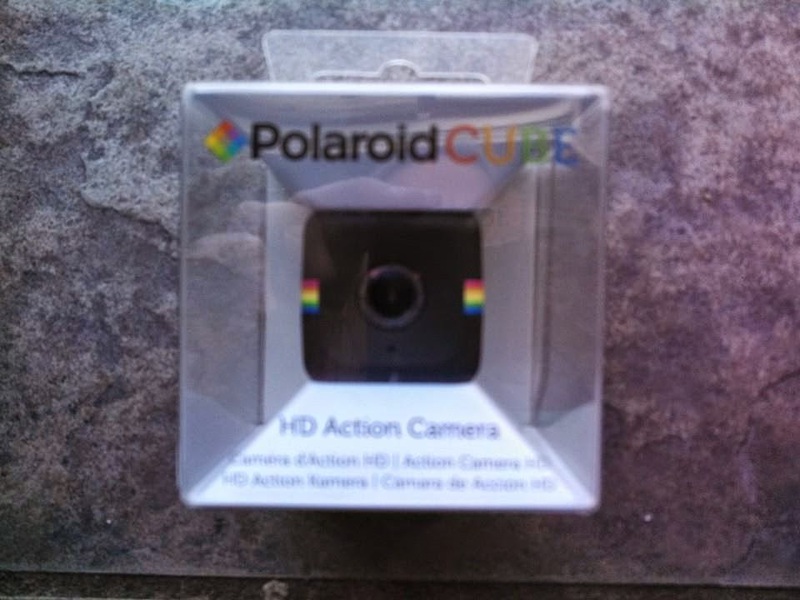 You can purchase the Polariod POLCS HD Digital Video Action Camera Camcorder on Amazon. Who among us doesn’t have a sports fanatic in their life? You’ve already given them jerseys, baseball caps and maybe even a bobblehead for their favorite team. Do something totally different this holiday season—do something delicious. This year, give them the gift of chocolate with the #1 Fan Collection offering Replica Chocolate Stadiums and Arenas! From Football to Baseball, Hockey and Basketball, this collection has offers an array of options for every sports lover. The colossal coliseum consists of over one pound of premium American milk chocolate. The stadiums are filled with foil wrapped chocolate sports balls. 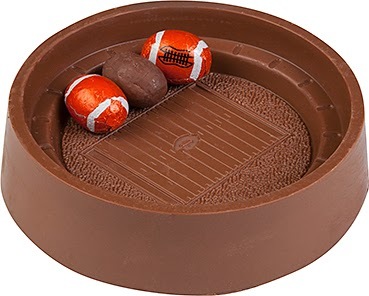 The chocolate stadium comes packed in a keepsake tin with a decorative sports themed ribbon. Sports Chocolates offers Football, Basketball, Baseball, Hockey and Soccer stadiums, plus Lacrosse fields, tennis courts, golf holes and even a chocolate roulette wheel. At a price of $34.95 they make an affordable holiday gift and are available at www.sportschocolates.com. Enter to win your own Sports Chocolates by entering the rafflecopter below. Contest will start November 16th and run til December 13th 2014. Open to U.S. residents only. A scientifically-validated nutritional supplement for optimization of sexual health, with formulas available for both men and women. Each formula has been carefully balanced to meet the unique needs of the user, utilizing L-arginine, Panax ginseng, Ginkgo biloba, damiana leaf, vitamins A, C, E, B6, B12, Biotin, folate, niacin, pantothenic, acid, riboflavin, thiamin, as well as the minerals calcium, iron, and zinc. With ingrediants designed to increase blood flow and relieve fatigue, the result is a gradual, natural increase of sexual fitness. 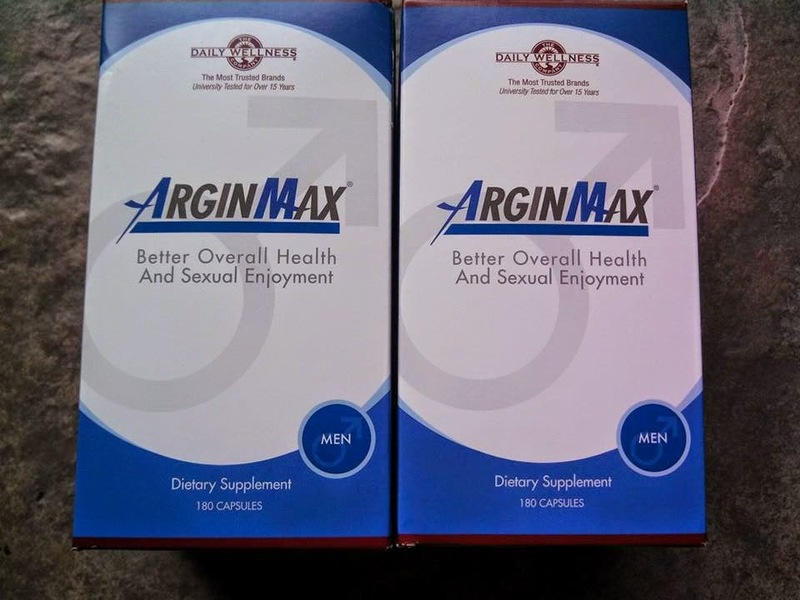 You can purchase these by visiting www.arginmax.com. The first nutritional product to synergistically combine key natural ingredients to prime the body for conception. 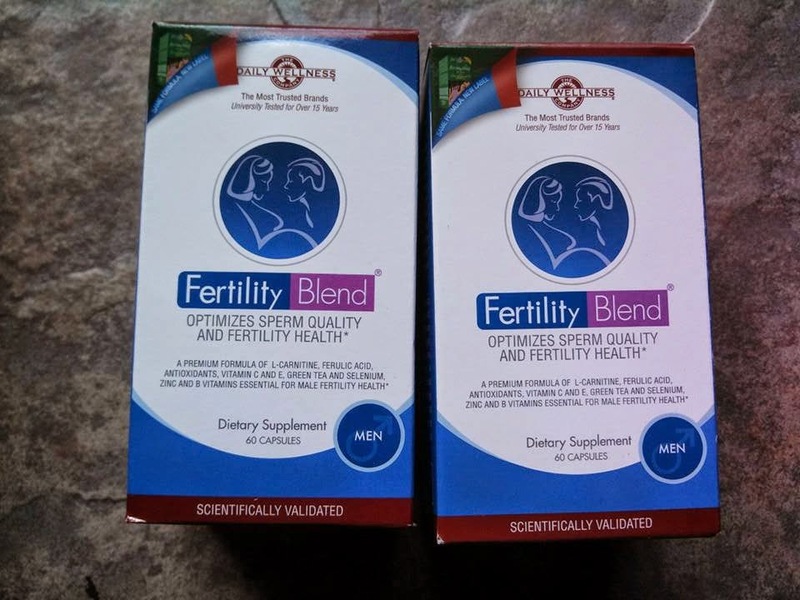 FertilityBlend for Men were developed based on published scientific literature on nutritional components that benefit fertility and have a safe history of usage. Key ingredients for Men: L-arginine (amino acid that has been shown to be critical to the formation of healthy sperm); Vitamins C and E, green tea and selenium ( all potent antioxidants that help improve sperm counts and quality); Ferulic acid (antioxidant that has been shown to improve sperm quality). You can purchase this product by clicking here. Turtle Wax ICE Premium Care Tire Shine 22 fl. oz. is a high endurance formula which provides a rick, high gloss coating and long lasting wet appearance. Turtle Wax ICE is made to be durable and put off the highest possible shine with spray on, no wipe convenience. Turtle Wax ICE Premium Care Tire Shine formula contains silicone to penetrate tire sidewall rubber and lock on a shine that last through normal wet driving conditions. The thick formula clings to vertical tire sidewall surfaces and virtually eliminates "tire sling" onto body panels. Turtle Wax ICE Premium Care All Wheel & Tire Cleaner 22 fl. oz. removes dirt and grime from tires while protective barrier makes future cleaning easier. Turtle Wax ICE Premium Care All Wheel & Tire Cleaner safely loosens and lifts baked on brake dust, dirt, grime, surface stains and more. No need to scrub the surface with a harsh brush, simply spray, lightly agitate soils and watch the cleaning action as dirt is removed. Turtle Wax ICE Spray Detailer 20 fl. oz. is made with a super slick formula. The polymers in the Turtle Wax ICE Spray Detailer will keep your car looking super slick in between routine waxing adn revitalizes wax durability and water beading. Designed specifically to work with Turtle Wax ICE Liquid and Paste wax it goes on quick and fills in swirl and water marks. The unique formula will not streak when applied in direct sunlight or hot surfaces, and does not leave a white residue. Turtle Wax Jet Black BLACK Spray Detailer 23 fl. oz. boost and maintain shine intensity in-between washes for the blackest paint. Developed exclusively for black exteriors, the brag-worthy results are sure to make other car-drivers envious of the slick, like new appearance. Dedicated black-tinted technology provides and eye-catching shine in between regular washing and waxing. The carnauba enriched formula gently cleans and removes light dust and fingerprints, while filling in swirl marks. Easily boosts the shine of black paint, bumpers, trim, window seals and more. 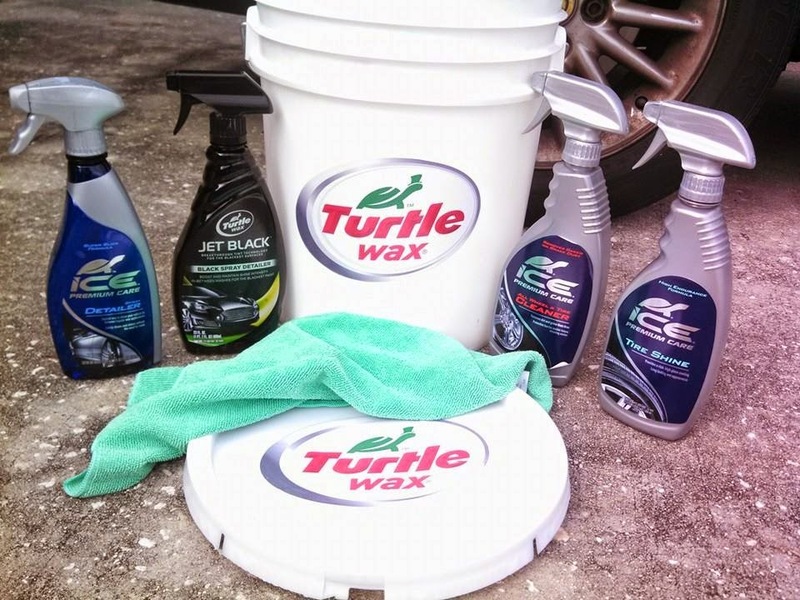 You can purchase the whole line of Turtle Wax products at your local retail store. Or visit the Turtle Wax website www.turtlewax.com. This year for his stocking why not something a little different with ACME Ruby Bay Smoked Fish Jerky. You can purchase different flavors of fish which is cured and dried for a satisfying taste. Ruby Bay’s line of specialty smoked fish includes traditional favorites to trend-setting specialties. A premium selection of wild salmon jerky is the newest introduction to this line. 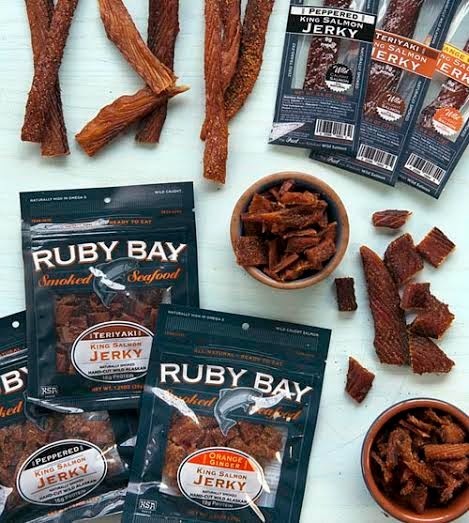 You can purchase in Whole Foods Market or you can also order online by visiting Ruby Bay's website here.